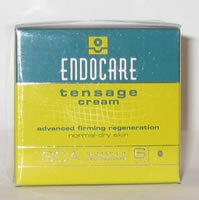 Endocare Tensage Cream is a smooth, richly textured regenerating cream. Its exclusive technology fights loss of skin tone and firmness by carrying out a dramatic lifting activity which preserves elasticity and helps redefine facial contour. It prevents and slows visible signs of ageing, leaving skin firmer, smoother and brighter. Apply morning and/or evening to skin after cleansing. With SCA Biorepair Technology, one of the most powerful natural sources of skin regeneration; developed from research into radiation-damaged skin.